A witch named Cackletta has stolen Peach's voice, so she can use its power to awaken the wish-granting Beanstar in the neighboring Beanbean Kingdom. Mario and Luigi set out to the Beanbean Kingdom to restore Peach's voice and stop Cackletta's evil scheme. You control Mario and Luigi together, using individual and team-up moves to navigate the world and battle enemies. You can switch which brother takes the lead, and you may have to control both at the same time. In battle, watch the enemies carefully and time your button presses to dodge enemy attacks or unleash more effective attacks. 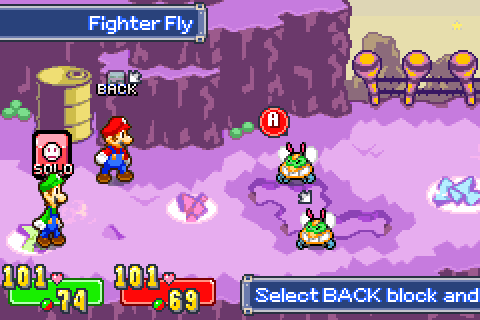 The Fighter Fly enemy was originally one of the enemies from the arcade Mario Bros. 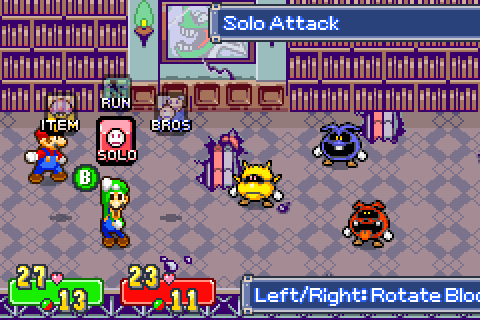 The red, yellow and blue viruses from Dr. Mario appear as enemies in Hoohooniversity. When attacked, they roll around on the floor as they did when hit with Megavitamins in their original appearance. 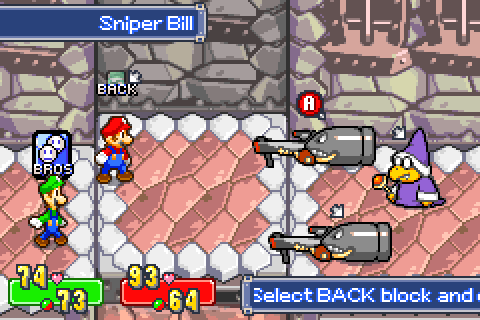 The enemy Sniper Bill is armed with a Super Scope, the SNES light gun. After defeating the Chuckola Cola, Luigi has to rescue Mario in an underground area. In this scenario, barrels roll down a tower of platforms, reminiscent of the arcade Donkey Kong. On the S.S. Chuckola you have to play a barrel minigame hosted by a skeleton gorilla named Bink (Japanese name Binky) who is modelled after Donkey Kong. Tomato Adventure was a Japan only Game Boy Advance RPG developed by Alphadream, the developers of Mario & Luigi: Superstar Saga. 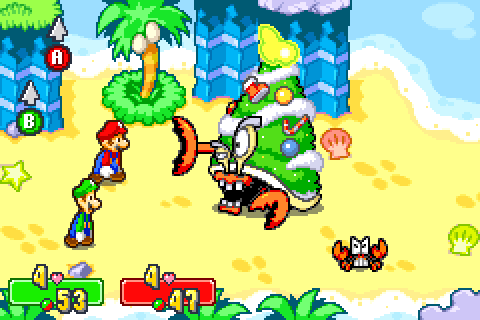 One of the boss battles is against a hermit crab decorated like a Christmas tree named Hermie III. He is based on the Hermie enemies from Tomato Adventure, who were also decorated hermit crabs. 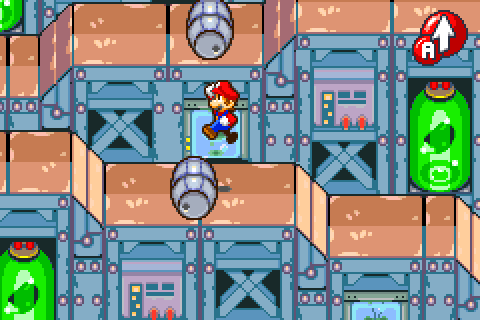 During the battle, Sidesteppers from Mario Bros. also appear. 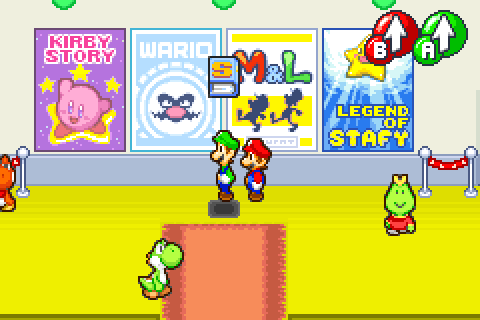 A number of songs from Tomato Adventure were discovered in the Mario & Luigi soundtrack. None of the music can be heard in-game. 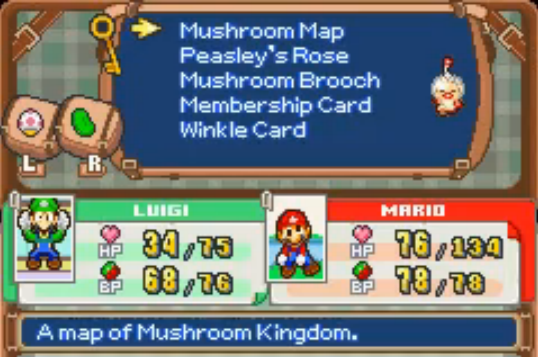 When you reach Mushroomtop Village, you must head to the arcade and play a bar-tilting game before you can do anything else. The instructions are read to you by a small model of Geno, one of Mario's companions from Super Mario RPG: Legend of the Seven Stars. 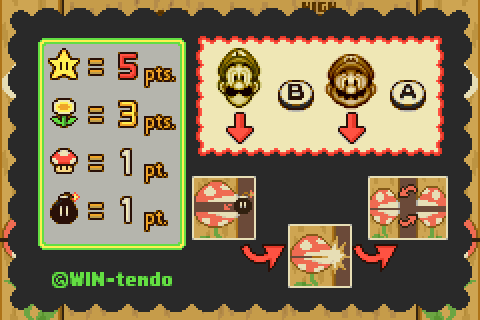 When you click Help in the Item Spill game, the help screen shows a copyright to "WIN-tendo", referencing Nintendo. 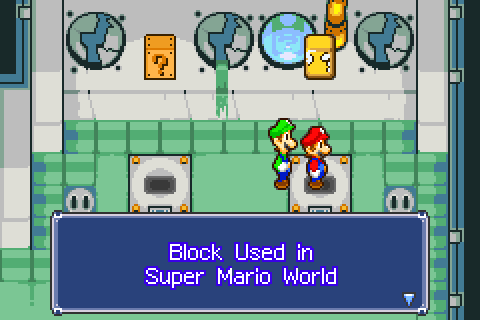 In Hoohooniversity, there is a Block Museum, with blocks on display from Super Mario Bros., Super Mario World, Super Mario 64 and Paper Mario. On your travels to the Beanbean Kingdom you come across a jumping game against the Sledge Bros. 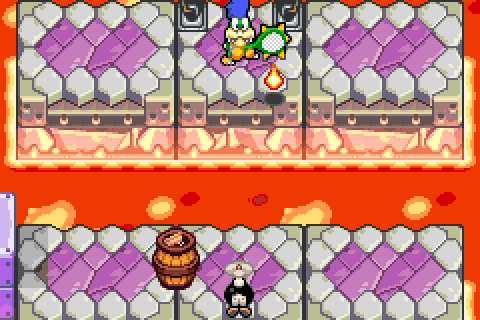 The background of the gatehouse shows an 8-bit style flagpole and castle scene from Super Mario Bros. The flag rises up the flagpole during the skipping game. "Look at that craftsmanship! POW! 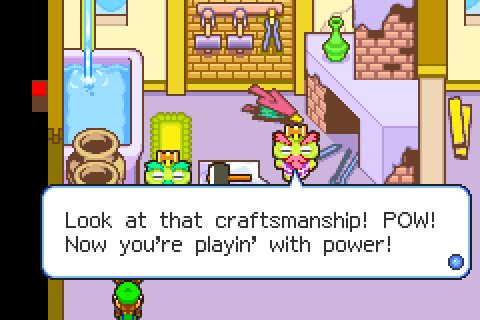 Now you're playin' with power!" "Now You're Playing With Power" was the Nintendo of America advertising slogan used for the NES, SNES and Game Boy. 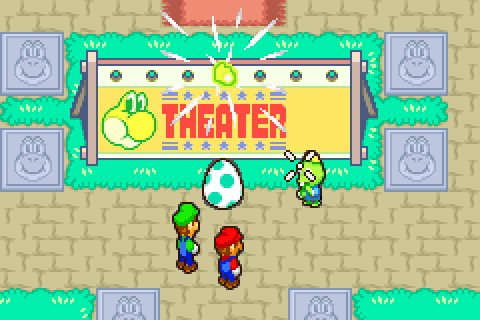 Outside of the Yoshi Theater, Boddle transforms himself into an egg and aims himself using the cursor from Yoshi's Island. This could also be referencing Yoshi's Story, where Yoshi could turn himself into an egg and shoot himself across the stage. 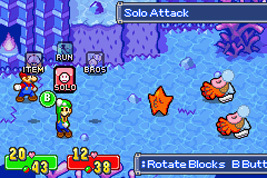 During the battles against Shadow Thief Popple (and his apprentice Bowser), the music includes portions of the final Bowser battle theme from Super Mario Sunshine. 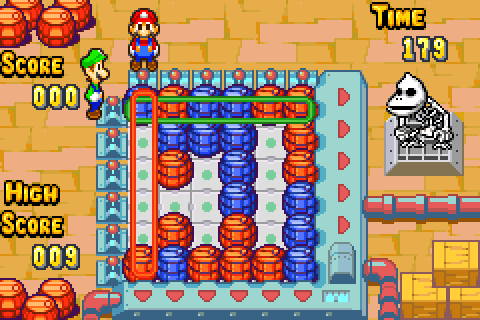 Bowletta communicates with Mario and Luigi using a holographic transmission device shaped like a Game Boy Advance. "You may have defeated my darling, but that's as far as you go!" 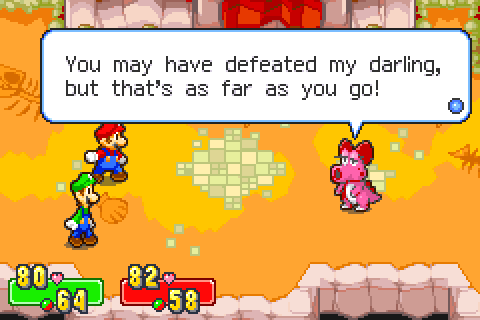 In Super Mario Advance, when you approached Birdo she would say "That's as far as you go!" in speech. 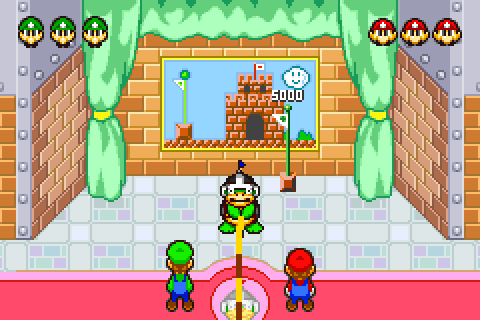 The hospital in Little Fungitown is shaped like a castle from Super Mario Bros., and has a flagpole outside. 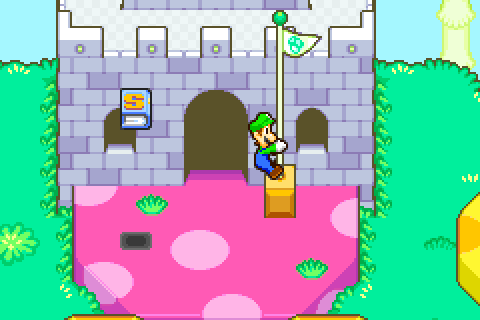 If Mario or Luigi jump on the flagpole, they slide down it and jump off, also referencing Super Mario Bros. The Koopa Kids each use attacks based on their earlier appearances, except for Larry, who attacks with a tennis racket. One theory behind this is that his name is spelled the same as "Rally" in Japan. The tennis racket he uses is the same as Bowser's racket in Mario Tennis. 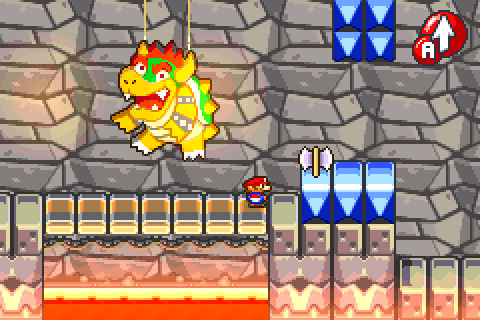 In Bowser's castle, you find a fake Bowser hanging from the ceiling over a bridge. Touch the axe to break the bridge and Bowser falls into the lava. This is based on the Bowser battles in Super Mario Bros.
During various scenes, E. Gadd appear in a Game Boy Horror, ghosts from Luigi's Mansion appear, and E. Gadd rides in on an improved Poltergust 3001. However, there is more to this story than meets the eye. See below for more details. 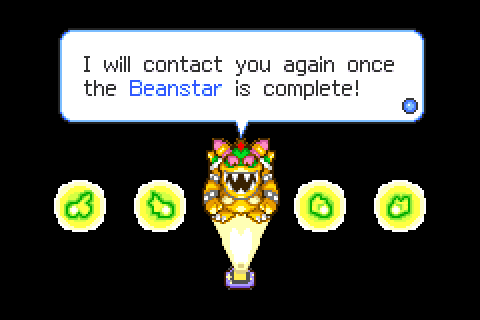 While in the final game you only meet E. Gadd in the Starbeans Café, originally the intention was to meet a different guest character each time you bought a drink, and each time they would reward you with a different accessory. The data for the original characters is still in the game, including sprites of the characters and accessories, as well as transcripts of the original conversations. 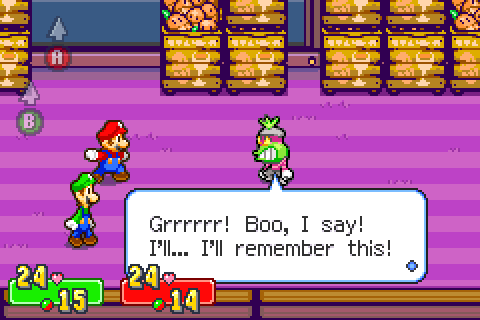 After buying the Woohoo Blend, Professor E. Gadd from Luigi's Mansion appears and gives you the Game Boy Horror. This was changed to the Game Boy Horror SP in the final game. Cashier: Oh! Professor Gadd! How've you been, sir? Are you here to try our new drink? You can ask those two there for Woohoo Blend! Oh! Just wonderful! A new blend! How about a try, youngsters? Hmm… This flavor fills the old bones with brimming strength! Yep, a drink like this'll surely boost my spirits during ghost research. Listen, youngsters, let me thank you. I insist you take this. After buying the Hoohoo Blend, Wario of the Mario series appears and gives you the Wario's Gold accessory. This was changed to the Greed Wallet in the final version. Wario: Ah ha ha ha! Move it! Wow! Now that I'm here, this game's finally gettin' good! Cashier: Oh! Wario! What's a bad dude like you doing here? Oh! I got it! You came to pay your tab from the other day! Cashier: Aww, come on! Just pay up! I'll even take beans if you got 'em. Come on! You're a rich guy, right? 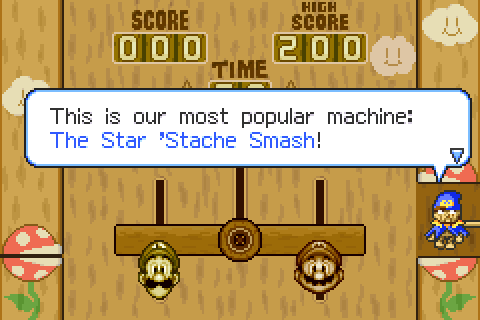 Wario: Uh… OK. Maybe next time. But… Don't you have free drinks for celebrity guest stars in this game? Wa ha ha ha ha ha ha! BLECH! AWFUL! Do you guys really like drinking nasty stuff like this? …Losers. Ah! Whatever! Hope this covers your costs! Blech! Drinkin' that stuff made me wanna go shave my tongue! Uh-oh! Gotta go!" After buying the Chuckle Blend, Fox McCloud, hero of the Star Fox series, appears and gives you the Gold Ring accessory. This was changed to the Bonus Ring in the final version. Cashier: Hey! Aren't you Fox McCloud, the Star Fox leader? Are you here to taste our new juice? No way! Fox: Uh…yeah. So why don't you serve me up a cup at your special guest star rate? What's that? A call? Call: Fox! Help me! Fox! Where are you?? Cashier: Wow! You sure are one busy guy… Er, I mean, one busy fox! Fox: Thanks for the discount! Will this cover the rest? Mission complete! After buying the Teehee Blend, Captain Olimar from the Pikmin series appears and gives you the UV Lamp accessory. This was changed to the Cobalt Necktie in the final game. Captain Olimar's text appears in a popup window rather than a speech box, referencing his scientific observations from the Pikmin games. Cashier: Wow! This is a rare treat! If it isn't Captain Olimar! Olimar: What is this? Before my eyes stands a strange life form. It resembles me slightly, so I shall dub it…Marlio! …Further investigation indicates that the drink that this Marlio holds is the source of the aroma. I shall now partake of its flavor. I have just noticed a strange, unsightly green creature standing next to the Marlio… It could be a dangerous life form. I feel I should attack it before it attacks me. After buying the Hoolumbian, Samus Aran from the Metroid series appears and gives you the Energy Tank accessory. This was changed to the Power Grip in the final game. Cashier: Whoa! A power outage? Yikes! Samus Aran! I see you're rocking and rolling as usual! …Looks like your energy tanks are empty! Sorry, but can't you give your Hoolumbian to Samus? Oh! Feeling better? After buying the Chuckoccino, an Excitebike rider appears and gives you the Excite Spring accessory. Cashier: Hey? Is that the sound of a motorcycle I hear? Hey, buddy! What are you doin'?! This isn't a drive-through!!! What? Are you thirsty or something? Fine, but no need to get so…EXCITED! After buying the Teeheespresso, Link from The Legend of Zelda series appears and gives you the Triforce. 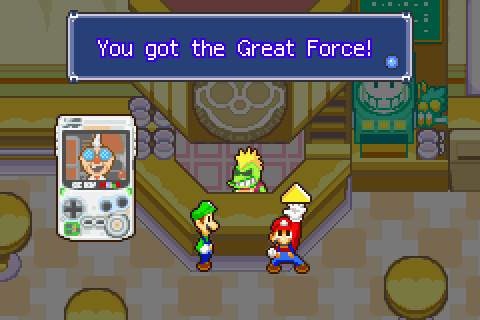 This was changed to the Great Force in the final game. Cashier: Whoa! Link! The Hero of…what is it, now? Anyway, long-time, no see, buddy! What are you doing here? Did you get lost in a dungeon again? What? You're having trouble finding the fairy fountain? Oh… It's game over, and your bottles are all empty? Are your hearts filled now, kiddo?